Matrix the advance communication system, offers convenient features and flexible functionalities to large businesses in line with their changing needs. The reliable architecture and easy to use platform delivers the unmatched performance to meet the needs of controlling costs and managing operational expenses. ETERNITY GE supports any combination of TDM, IP and GSM trunks and subscribers along with networking of multiple systems across locations. 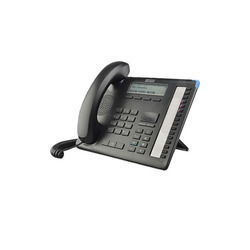 Matrix Intercom epabx system Key Telephone Instrument neo 48 s.
Looking for Intercom Systems ?